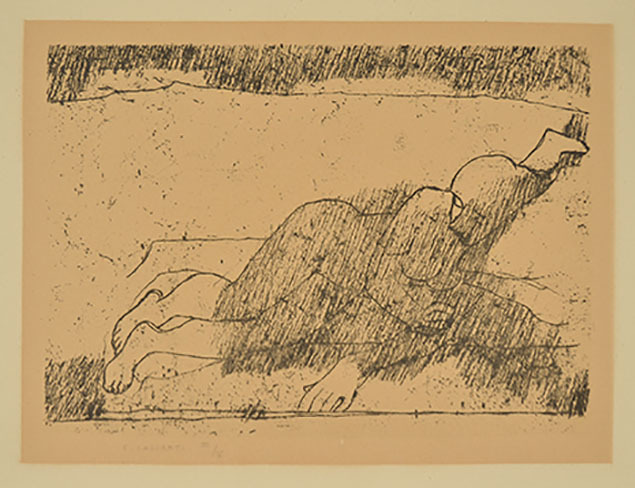 Lithograph, from the series Casorati Dieci Litografie (Numerus, mensura, pondus), 1946; signed and numbered in pencil F. CASORATI III/V. The set was published by Collezione del Bibliofilo in Turin. The only edition was of 100 impressions numbered with Arabic and 5 numbered with Roman numerals. These last 5 impression was pulled, as is the case of our print, on a yellow background. To the yellow background 282 x 377 mm; the full sheet measuring 353 x 494 mm. Casorati spent his formative years in Padua where he developed a passion for music and literature. He began to paint in 1902 but to please his mother he read law at the University of Padua, graduating in 1906. He continued to paint meanwhile and in 1907 he exhibited at the Venice Biennale. Casorati's early works were marked by the influence of the Viennese Secession, Art Nouveau and Symbolism. When his father died in 1917 he moved with his family to Turin, where he soon became a central figure in the intellectual circles of the town. In his more mature works, after the war, decorative detail was substituted by the meditation of an essential form, influenced by the mathematical spatial structures of 15th century painting. 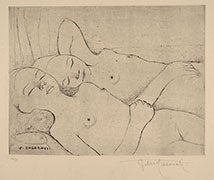 Although he took part at the Novecento exhibition in 1926 and in 1929, Casorati remained independent from the movement. In 1923 he opened a school for young artists in his studio in Via Mazzini, Turin. In 1925 he was among the founders of the Antonio Fontanesi Fine Arts Society, to promote exhibitions of contemporary nineteenth century Italian and foreign artists. In 1935 the studio of Casorati and Enrico Paulucci held the first collective exhibition of Italian abstract art, which included works of Licini, Melotti and Fontana. Casorati won the painting award at the Venice Biennial in 1938. He also received official recognition at the important exhibitions in Paris, Pittsburgh and San Francisco. 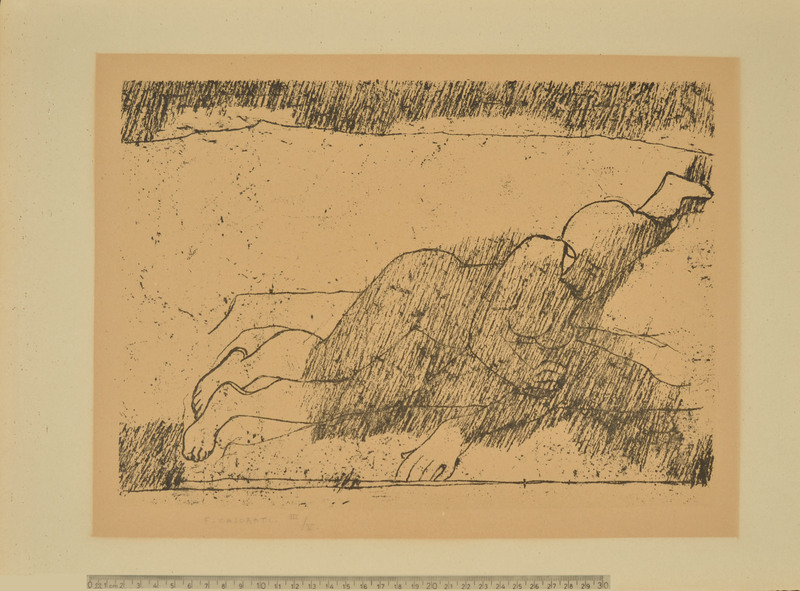 In 1952 he held a personal exhibition at the Venice Biennial, and with Ottone Rosai he received the special presidency award.